Immaculate and respected 2015 Toyota Sequoia Limited 4x4 with Power Moon Roof, Third Row Seating, Towing Package, Heated Leather Seats, and Mighty 5.7L V8 Engine! Stepping up to the Limited model gets you 20-inch alloy wheels, power-folding and auto-dimming outside mirrors, front and rear parking sensors and a power liftgate. Inside, everything from the SR5's Premium package is included as standard, along with a leather-wrapped steering wheel, leather-trimmed doors, upgraded gauges, a rearview camera display integrated into the higher-resolution 7-inch touchscreen, a navigation system and a full suite of smartphone apps such as Pandora and OpenTable. 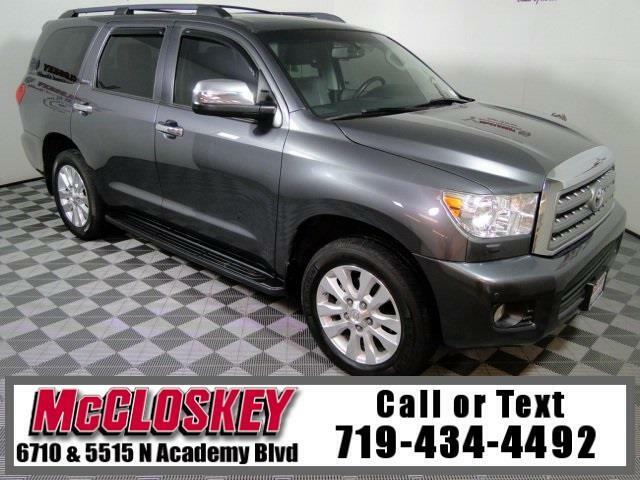 The 2015 Toyota Sequoia comes standard with a 5.7-liter V8 engine rated at 381 hp and 401 pound-feet of torque. This vehicle passed our 110 multi-point inspection and is backed by our National Quality Dealer of the Year Award. We are an ''A+'' Better Business Bureau Rated Business. We offer low interest rate financing, low down payments and the highest trade allowances in the state! Here at McCloskey we do things a bit differently, we shop our competition every day to ensure a great value to you. Come on down and experience it for yourself. This McCloskey Assured vehicle includes a 2 month/2000 mile Warranty and a Vehicle History Report!! At McCloskey we strive to provide ASSURANCE, TRUST, VALUE AND QUALITY! Call 719-434-4492.